If the tips of your screwdrivers are too wide to fit in the small spaces where you need to use them, like in the heads of those tiny watch screws, or if they’ve simply become worn or dull over time we have the information you need to sharpen your screwdriver blades and get them working once again. How can you tell if you need to sharpen your blades? Look at the tips. Over time, your blades can be chipped or have sections sheared off and lose their straight edge. To fix it, you would simply grind off the uneven end, however that makes your blades too wide to fit in most small screw heads and that is when you need to sharpen the blade. 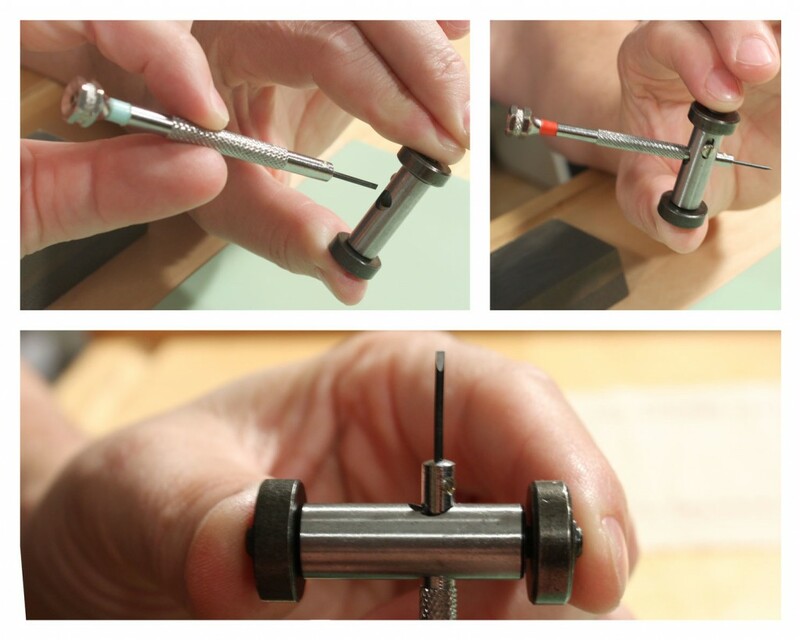 Be aware that you can ONLY sharpen flat-head screwdrivers! First you will want to examine the tips of your screwdrivers to see which will need to be sharpened. Position your loupe so you can see the magnified tips. If the blade tapers to a blunt end instead of a fine tip, you will want to sharpen it. Once you know which screwdriver blades need to be sharpened. Select one to start sharpening and set the rest aside where you can reach them later. Take your screwdriver holder and squeeze the ends together to reveal the hole for your screwdriver. Hold the ends together and slide your first screwdriver into the holder. Position the screwdriver in the holder so that the solid portion of the screwdriver handle above the blade is sitting just inside the holder. Positioning the screwdriver farther in or out of the holder will adjust the angle of the blade. After you have the screwdriver positioned in the holder, you will want to align the screwdriver blade with the holder so that you can sharpen it evenly. The blade should be parallel or flat with the tool. 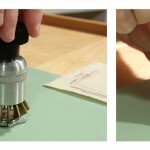 Verify the correct position by resting the blade on a flat surface such as your sharpening stone. We would recommend that you use your magnifier to check the alignment when you think you have it in the correct place. If the blade isn’t flat with the holder, you will end up sharpening it at an angle and end up with a misshapen screwdriver. When you are satisfied with the position of the blade, take your screwdriver and holder and place it over the sharpening stone so that the blade is on top of the stone itself and close to one end of the stone. Now you are ready to begin sharpening. 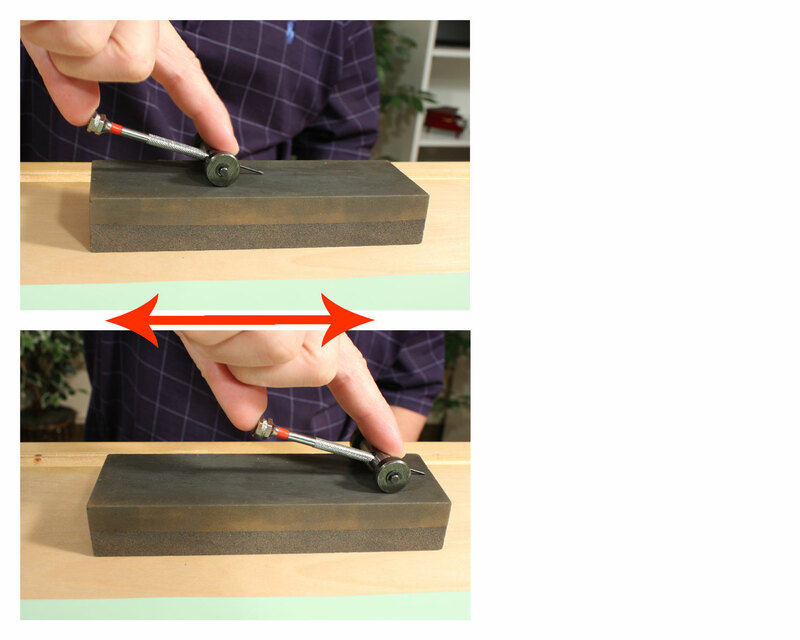 Use your index finger to push the blade of the screwdriver down against the sharpening stone as you grip the holder. Be sure to use medium pressure as you press down on the blade. You want enough to keep the blade against the stone and sharpen it, but not so much that you are grinding the blade into the stone and risking breaking it. It is always better to start light and work your way up to more pressure if needed. Once you are comfortable with the position of the screwdriver you are going to slide the blade back and forth across the long side of the stone to sharpen it. Keep the pressure on the blade steady throughout this process. Count each back and forth motion as one pass across the sharpener and start by making ten passes across the stone with the first side of the blade. Check your progress. You should be able to see where you have been grinding away at the blade. Then, turn the screwdriver and holder over so that you can repeat this process on the other side of the blade to sharpen it to an even point. Hold the blade to the surface of the sharpening stone with the same amount of medium pressure that you used before, and make ten back and forth passes with the blade across the stone. Check your progress again. You should be able to see where you’ve ground away a small bit of the blade on either side. Wipe the tip of the blade with your cleaning cloth to clear away any debris. Examine the blade from the side so that you can see how fine the point is. If the blade is still mostly blunt, repeat the process and grind a little more from each side of the blade edge. However, you need to be careful not to over sharpen the blade. The sharper you make it, the weaker it becomes, so you must aim to find the balance between a fine point and weak point. Once are satisfied with the sharpness of the blade, you will want to examine the tip again. 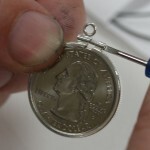 It should be the smallest bit squared off at the end to allow it to grip in a screw head. If the blade is knife-point thin, take your sharpening block and hold it upright so that you square off the end of the blade slightly. Hold the blade tip perpendicularly against the sharpening stone and make a small number, usually about five, of back and forth passes to correct the edge of the blade. Be sure to check your progress often so as not to over flatten the tip. When the tip is slightly squared, and the blade is the right thickness, wipe off any remaining debris and you are finished. Repeat these steps to sharpen any of your other screwdrivers that are getting a bit dull. For other great watch repair tips and tricks, check out our Learning Center today!